Just like the first exhibition, “+Retrats Viscuts” are portraits of people that had become popular in the village due their profession or activism. This year I have had the opportunity to photograph the poet Teresa d’Arenys and the theatre director Jordi Pons. The resulting portraits has been published recently in this blog under the tag “Lived portraits“. One more year working with the subjects has been a great experience. I wish you enjoy “Retrats Viscuts”! on la vida és impresa. Last year exhibition “Retrats viscuts” had a great success in Arenys de Mar. As a result, a new edition is ready. 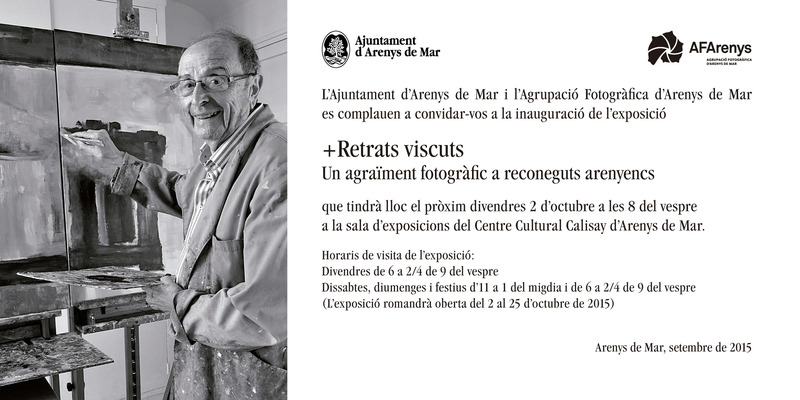 “Retrats viscuts” or “Lived portraits” was a collection of portraits of people from Arenys de Mar. All of them were older than 60 years and have had a significant public live in the village. This year 35 new portraits will complete the collection. My contribution to the exhibition are the portraits of Teresa d’Arenys, poet, and Jordi Pons, theatre director. I really enjoyed to work with them.